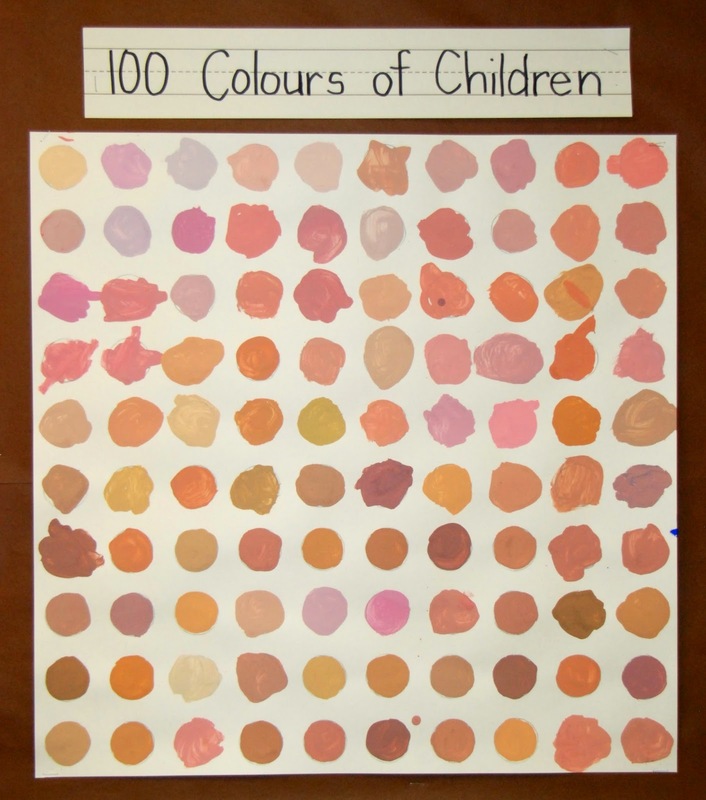 A record of our experiments in mixing "skin colours." 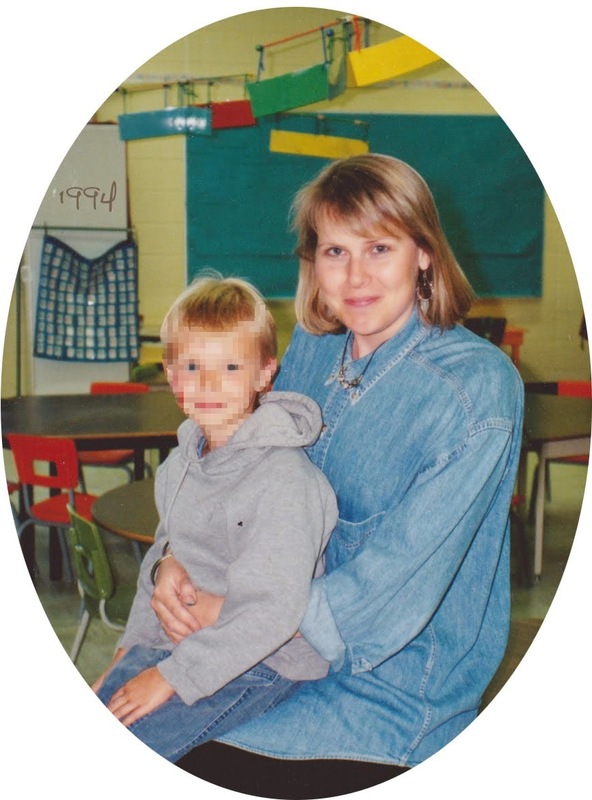 In my small grade one class, we have skin tones that cover the whole glorious visible spectrum of humanity. But last spring I overheard a conversation amongst a small group of students in which it became clear that the concept of "skin colour" is more complicated than it seems. So when my order of "multicultural" markers, pencil crayons and wax crayons arrived a few weeks ago, I decided to let them become a "provocation" (in the Reggio Emilia sense) to my students; or at least a jumping-off point for an honest conversation about the many colours of people in our community and our world. Hand drawings in various skin tones. I distributed the drawing materials to the kids and asked them to show me one that is "skin-coloured." 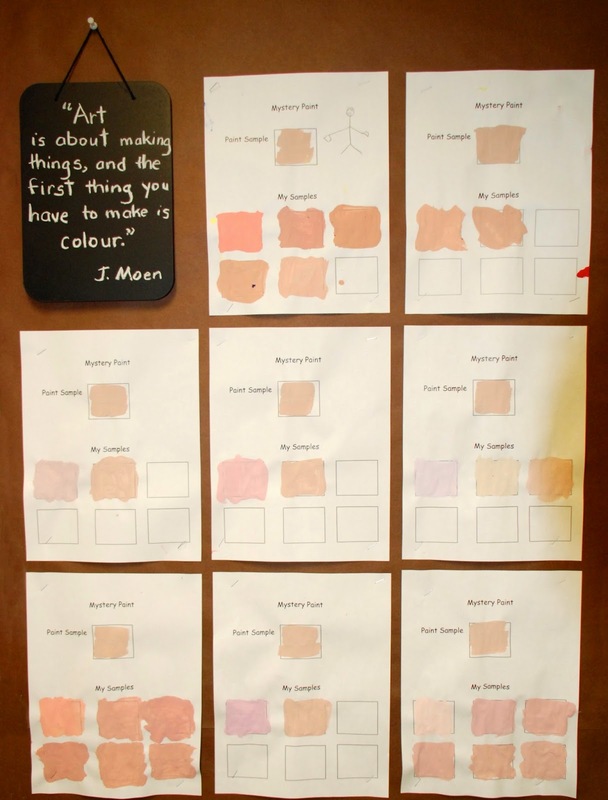 Most of them picked the palest peachy hue -- even the kids whose skin tones didn't match that colour in the slightest. Then I asked them to find the one in the bin that was closest to their own skin tone and hold it up for me. Again, some of the dark-skinned kids held up light-coloured selections. So we spent some time pulling out different options and holding them next to our skins to find the closest colour match for each child. Then I showed them how to mix skin colours using tempera paint. The recipe includes white, red, yellow and blue -- in varying proportions for varying tones. I gave them the task of matching my skin colour, which I had earlier produced as the "Mystery Paint" sample. Periodically as they were experimenting, I called them over to paint a circle of their colour-in-progress on a grid of 100 circles. The challenge was to mix 100 different skin tones. Left: "You have to mix red, blue, yellow and white." Through a process of trial-and-error they each came to the closest approximation they could of my own colour. Then I challenged them to make it darker. Again the experimentation began. 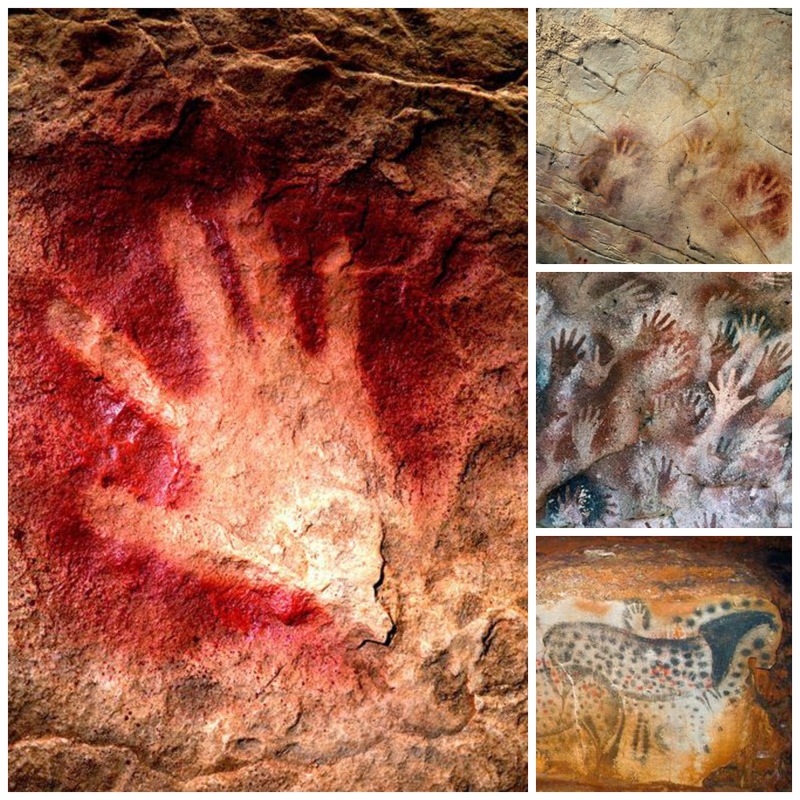 Some of the oldest paintings in the world are of the maker's hands. La Cueva de las Manos, Argentina. 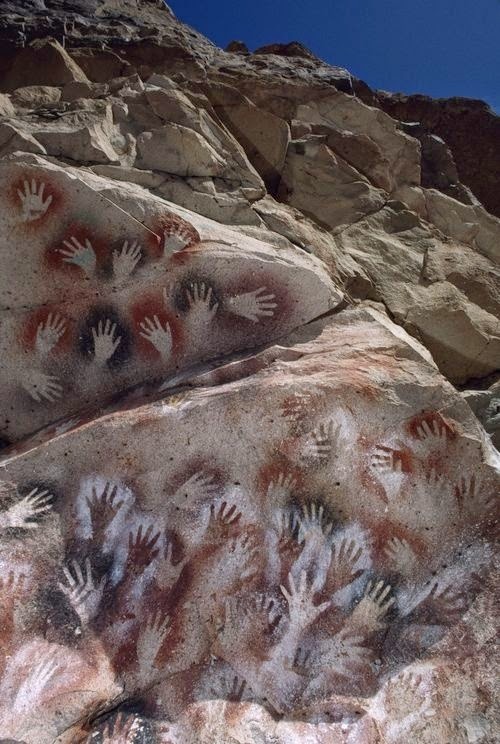 Finally, we looked at early cave paintings of people's hands. 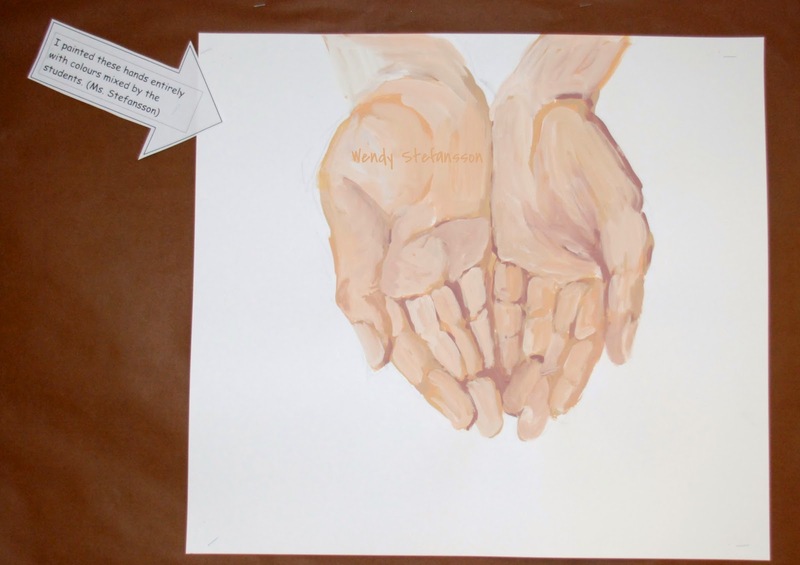 Then the kids traced their own hands and painted them in with the first colour they had mixed, adding shadows around the edges with their darker shades. 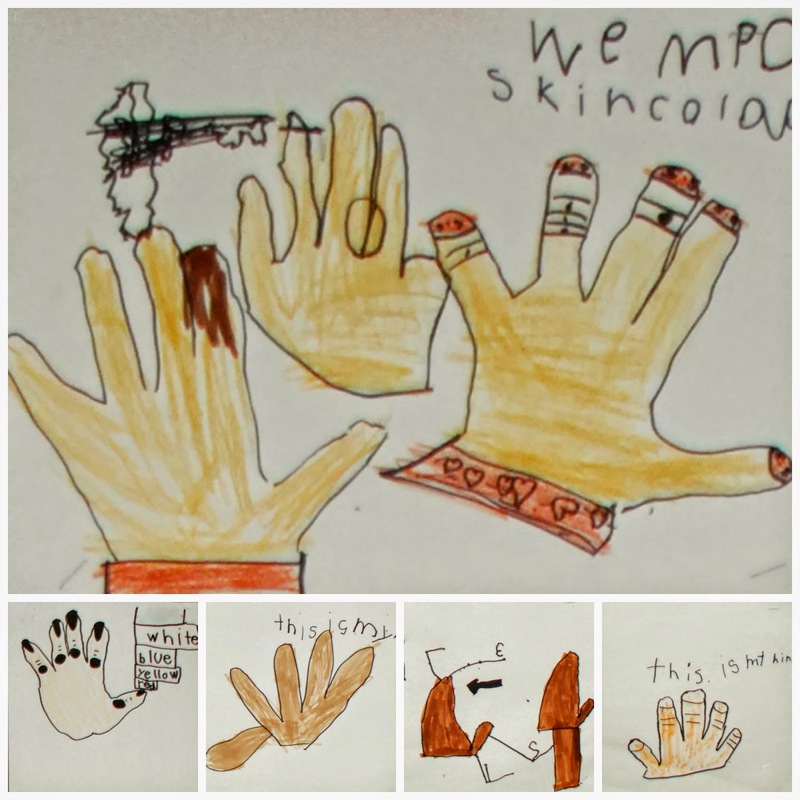 Hands painted by the grade ones. Hands I painted with the leftover paint the kids had mixed. After the kids went home for the day, I used some of their leftover paint colours to paint a pair of hands of my own. Then I tried to document the learning that had gone on that afternoon on a bulletin board outside our class room. Bulletin board, a.k.a. the documentation of learning panel.